For over fifty years, Noam Chomsky has been exposing the crimes of the United States military across the world. Less well known is the fact that throughout this time, he was working in an electronics laboratory funded primarily by that same military. This article investigates the paradox, arguing that the Pentagon’s institutional support for Chomsky’s scientific work explains the special passion driving his political stance. 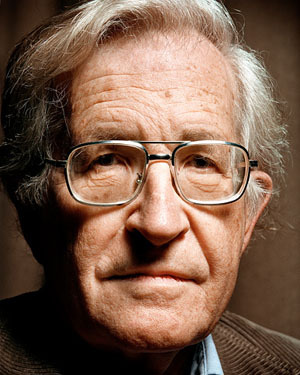 NOAM CHOMSKY ranks among the leading intellectual figures of modern times. He has changed the way we think about what it means to be human, gaining a position in the history of ideas – at least according to his supporters – comparable with that of Darwin or Descartes. Since launching his intellectual assault against the academic orthodoxies of the 1950s, he has succeeded – almost single-handedly – in revolutionizing linguistics and establishing it as a modern science. Such victories, however, have come at a cost. The stage was set for the ensuing ‘Linguistics Wars’(1) when Chomsky – at that time a young anarchist – published his first book. He might as well have thrown a bomb. ‘The extraordinary and traumatic impact of the publication of Syntactic Structures by Noam Chomsky in 1957’, recalls one witness,(2) ‘can hardly be appreciated by one who did not live through this upheaval.’ From that moment, the battles have continued to rage. How could a technical book on syntax have produced such dramatic effects? By his own admission, the author knew little about the world’s different languages. Indeed, he outraged traditionalists by claiming he didn’t need to know. Chomsky was not interested in documenting linguistic diversity. Neither did he care about the relationship between language and human thought or social life. As far as his opponents could see, he was not really interested in linguistics at all. He seemed to be more interested in computers. Several questions arise. Why did Chomsky – an outspoken anarchist and antimilitarist – take the money? Secondly, what did the military think they were buying? Both questions are sharpened by the fact that MIT at this time had no tradition in linguistics. This confronts us with a third puzzle: why was such military investment not directed to an institution with a proven record in linguistic research? ‘The Air Force has an increasingly large investment in so called “command and control” computer systems. Such systems contain information about the status of our forces and are used in planning and executing military operations. For example, defense of the continental United States against air and missile attack is possible in part because of the use of such computer systems. And of course, such systems support our forces in Vietnam. The colonel went on to express the Air Force’s ‘satisfaction’ with UCLA’s work. On the eve of the computer age, Chomsky’s Syntactic Structures excited and inspired a new generation of linguists because it chimed in with the spirit of the times. Younger scholars were becoming impatient with linguistics conceived as the accumulation of empirical facts about locally variable linguistic forms and traditions. Chomsky promised simplification by reducing language to a mechanical ‘device’ whose design could be precisely specified. Linguistics was no longer to be tarnished by association with ‘unscientific’ disciplines such as anthropology or sociology. Avoiding the obscurities of sociocultural or psychosocial studies, linguistics would be redefined as the study of a ‘natural object’ – the specialised module of the brain which (according to Chomsky) was responsible for speech. Excluding social factors and thereby transcending mere politics and ideology, the reconstructed discipline would at last qualify as a natural science akin to mathematics and physics. As his argument unfolds, Chomsky rules out this first, crude design for his envisaged machine – it clearly wouldn’t work. By a process of elimination, he then progressively narrows the range of designs which – on purely theoretical grounds – ought to work. Thrillingly, Chomsky opens up the prospect of discovering in effect ‘the philosopher’s stone’: the design specifications of a ‘device’ capable of generating grammatical sentences (and only grammatical ones) not only in English but in any language spoken (or capable of being spoken) on earth. Without abandoning this extraordinary dream, Chomsky has since jettisoned most of the specifics in favour of yet another attempted solution – known as the ‘Minimalist Programme’. (14) It is hard not to suspect that should this in turn be discarded, the patience of even Chomsky’s most ardent supporters may run out. To his academic colleagues in the humanities and social sciences, Chomsky’s programme has caused predictable astonishment, exasperation and even outrage. How could Chomsky imagine it possible – even in principle – to construct a ‘device’ enabling scientists to ‘deduce’ the languages currently or historically spoken across the world? In replying to such critics, Chomsky accuses them of misunderstanding science. To do science, Chomsky explains, ‘you must abstract some object of study, you must eliminate those factors which are not pertinent…’(15) The linguist cannot study humans articulating their thoughts under concrete social or historical conditions. Instead, you must replace reality with an abstract model. ‘Linguistic theory’, Chomsky declares, ‘is primarily concerned with an ideal speaker-listener, in a completely homogenous speech-community, who knows its language perfectly and is unaffected by such grammatically irrelevant conditions as memory limitations, distractions, shifts of attention and interest, and errors (random or characteristic) in applying his knowledge of the language in actual performance.’(16) In this deliberately simplified model, children acquire language in an instant. (17) The evolution of language is also instantaneous. (18) The meanings of words – even historically recent ones such as ‘bureaucrat’ or ‘carburetor’ – are not socially constructed, having long ago been encoded in our genes. (19) The function of language is not social communication but ‘inner speech’ – clarifying thoughts by talking to oneself. (20) Speech is the natural, autonomous output of a dedicated computational mechanism – the ‘language organ’ – located in a special region of the individual human brain. Language, according to Chomsky, lacks the messiness we would expect of an accumulation of accidents made good by evolutionary ‘tinkering’. Characterised by beauty bordering on perfection, Chomsky’s postulated object is biology – yet not biology as we know it. It is easy to understand why computer programmers and engineers might find it useful to treat language as a mechanical ‘device’. If, say, the aim were to construct an electronic command-and-control system for military use, then traditional linguistics would clearly be inadequate. Such engineers would need a version of language stripped free of ‘meanings’ in any human emotional or cultural sense, cleansed of politics – and stripped also of poetry, humour or anything else not accessible to a machine. But military figures such as Colonel Gaines were not the only people hoping to benefit from the new approach. What of Chomsky’s other institutional sources of support? And what about his own fiercely anti-militarist, anarchosyndicalist politics? How did anticapitalist revolution connect with the ‘revolution’ Chomsky inaugurated in linguistics? Indeed, can the two sides of Chomsky’s output be reconciled at all? Was the young anarchist tailoring his theories to meet the requirements of his military sponsors – forcing us, perhaps, to question the sincerity of his anarchosyndicalist commitments? Or did he believe he was taking the money – refusing to let this influence his scientific results – in order to secure the best possible position from which to promote the anarchist cause? Chomsky’s politics, then, didn’t have to be learned from books. By his twelfth birthday, Chomsky had already rejected the politics of the Communist Party. Inspired by Barcelona’s anarchists, he adopted their defeated cause and in subsequent years has never abandoned it. As an anarchist, Chomsky naturally distrusted the state, large institutions in general, the university and all its functionaries. Disaffected intellectuals of this kind, according to one historian, ‘are less vulnerable to the corruption of title and salary because their resistance is moral, almost instinctual’. (45) Chomsky respected science, especially mathematics and physics. By the same token, he was deeply suspicious of the so-called ‘social sciences’, regarding them as patently ideological. Chomsky dreamed of ridding linguistics of such contamination. He would do this by detaching the discipline from its current institutional affiliations and rendering it purely formal, even mathematical. Was it no more than a happy coincidence that this was exactly what the nascent computer industry – and its military sponsors – required? Skinner accordingly treated human language in stimulus-response terms, identifying ‘meaning’ with the habituated response of the listener to the speech-sounds he or she repeatedly heard. Language was conceptualised as structured like a chain, learned by associating one link – via appropriate approval or ‘reinforcement’ – to the next. This stress on ‘learning’ was, of course, part of a much wider intellectual movement. It was closely linked to the notion of ‘culture’ that had been central to anthropology since the beginning of the twentieth century. Franz Boas and his students founded cultural anthropology in the United States by repudiating Darwinian and social-evolutionary traditions and by forcing a breach with physical anthropology. Their justification for ignoring ‘nature’ was that humans can apparently learn virtually any conceivable cultural pattern given appropriate contact, needing external input because they lack the precise instincts of other animals. Two years after publishing Syntactic Structures, Chomsky published a devastating review of Skinner’s Verbal Behaviour. He had been wise enough not to take issue with, say, the school of child psychology pioneered in the Soviet Union by Lev Vygotsky or the subtle and fruitful approach adopted by the Swiss developmental psychologist Jean Piaget. Despite major differences with psychoanalysis, these psychologists had echoed Freud in taking for granted that humans, like other animals, must have deep-rooted instincts of some relevance to a study of the mind. Chomsky, however, refrained from acknowledging the existence of such intellectual giants. By singling out behaviourism for attack and ignoring everything else, he succeeded in arranging the battleground to suit his own needs. According to Chomsky, we must choose one of two logical extremes. Is language ‘external’ to the individual? If so, a child acquiring its natal language needs repetitive training and behavioural moulding – a regime of punishments and rewards. At the opposite extreme is the assumption that language is ‘internal’. If so, the child’s pre-installed knowledge of language can simply to be allowed to ‘grow’. Chomsky’s review of Verbal Behaviour succeeded, it would seem, beyond its author’s wildest dreams. Published in the journal Language and subsequently splashed across the front cover of The New York Review of Books, the ‘case against B. F. Skinner’ set in motion a tidal wave of revolt against a school of thought increasingly perceived as Orwellian in its project to shape and manipulate human life. Following the Second World War, reviewing the undesirable conduct of large numbers of military personnel and insurgents worldwide, many of Bloomfield’s professional colleagues in the United States saw themselves living ‘at a time when our national existence – and possibly the existence of the human race – may depend on the development of linguistics and its application to human problems’. (51) The wave of McCarthyite witch-hunting which swept North America during the 1950s was in part premised on the belief that critics of ‘the American way of life’ must clearly have been brain-washed by ‘communists’. In this bitter cold-war context, linguistics was seen as a crucial weapon in the world-wide struggle for ideological control. How can language be an ordinary acquired skill? What kind of ‘skill’ is it when humans everywhere in the world ‘learn’ it in basically the same way and in equal measure? Languages – Chomsky points out – are not like other cultural patterns. They are not more or less complex, more or less sophisticated, according to the level of technological or other development. While differing from one another grammatically and in other ways, every human language is an equally intricate, complex intellectual system; none can be described as more or less sophisticated or ‘advanced’ . The human vocal tract is a complex arrangement – a combination of disparate structures whose original functions certainly had no connection with speech. (54) But with its independently controllable parts, the tract as it now exists appears eminently well designed for speech. This, too – as Chomsky’s colleague Lenneberg(55) was among the first to stress – illustrates the importance of ‘human nature’. No child needs to be taught to babble, any more than it needs instruction in suckling at the breast. The rhythmic lip and mouth movements are instinctive and enjoyable for their own sake. Given even a minimally loving and stimulating environment, the next transition – from babbling to mature speaking – occurs equally naturally. Like the transition from crawling to walking, it’s just part of growing up. It is as if humans have an instinct for language. 1.08 Chomsky: Politics or science? In accepting military funding for his early language research, Chomsky risked accusations of political corruption. How could an anarchist do such a thing? As if fending off such attacks, Chomsky went out of his way to clarify his political stance. Showing unusual courage, he led demonstrations and advocated ing civil disobedience in opposition to the United States’ war effort in Vietnam. As the political system is currently constituted, Chomsky argues, policies are determined by representatives of private economic power. In their institutional roles, these individuals ‘will not be swayed by moral appeals’ but can only be affected by the ‘costs consequent upon the decisions they make’. (57) Chomsky and his allies seemed vindicated when, after the Tet offensive of 1968, the joint Chiefs of Staff pointed out that the deployment of additional troops to Vietnam was being hampered by the need to ensure that ‘sufficient forces would still be available for civil disorder control’ at home. (58) During these and subsequent years, no American public figure did more to put the record straight on the United States’ invasion of Vietnam than Noam Chomsky. Other left-wing intellectuals may not have felt quite the same need to deny personal culpability for their country’s actions around the world. Chomsky experienced this need as intimate and morally inescapable. But simply to explain his political stance was not enough. Chomsky’s overall programme had to appear consistent. He could hardly afford to let his critics suggest that although his politics were progressive, his linguistic theories were clearly reactionary. His anarchosyndicalism and antimilitarism had to be constructed as consistent with his linguistics. Somehow, the corporate backed and financed ‘cognitive revolution’ in psychology and related sciences had to be presented as intrinsically liberating and consistent with Chomsky’s political beliefs. He did not have to look far for a solution. Chomsky projected the ‘language device’ of his electronics laboratory into the brain of the human child. In real life, the human brain is not composed of wires or switch-boxes of the kind a 1950s computer engineer might devise. But if Chomsky’s electronic ‘device’ could henceforth be conceptualised as a feature of the maturing human brain, it would nonetheless solve a number of pressing problems. In fact, according to Chomsky, revolution remains possible because of the deep-rooted human instinct to resist. ‘Over sixty years ago, Walter Lippmann discussed the concept of “the manufacture of consent”, an art that is “capable of great refinements” and that may lead to a “revolution” in “the practice of democracy”. The idea was taken up with much enthusiasm in business circles – it is a main preoccupation of the public relations industry, whose leading figure, Edward Bernays, described “the engineering of consent” as the very essence of democracy. In fact, as Gabriel Kolko notes, “from the turn of the century until this day, [the public mind] was the object of a cultural and ideological industry that was as unrelenting as it was diverse: ranging from the school to the press to mass culture in its multitudinous dimensions”. The reason, as an AT&T vice president put it in 1909, is that “the public mind ... is in my judgment the only serious danger confronting the company”’. Let us retrace our steps. Consider Chomsky the young anarchist, faced with the problem of breaking into academia. Given his outspoken views, how was he to overcome the many obstacles that would naturally be placed in his way? It would appear that Chomsky found a way of turning his apparent political handicap into an advantage. Financially and institutionally, the requirement – he knew – was for an agenda the precise reverse of anarchosyndicalism. The 1950s represented the dawn of the new computer age. Key intellectual and technical developments were being funded by the American military. These and other corporate forces required a new version of cognitive and linguistic science, having little in common with what they saw as Marxist-inspired versions of sociology or anthropology. What was needed was a psychology and a linguistics completely stripped of social content or political awareness – a version of these disciplines rigorously re-engineered and fine-tuned to serve the computer age in the name of ‘cognitive revolution’. But how could the left’s ‘natural’ ascendancy in these disciplines be overturned? Corporate America needed someone of intellectual integrity and – preferably – of unimpeachable political integrity to act as its standard-bearer in organizing the necessary coup. Ideally, this person should not only be ‘left-wing’ in an ordinary, run-of-the-mill sense. The perfect candidate would be sufficiently left-wing to outflank everyone else in the race. Chomsky in 1957 was the right person arriving in the right position at exactly the right time. Such a system, however, cannot cope with vagueness, with polysemy or with metaphoric or figurative meanings – in other words, with the stuff of human language. Consequently, Chomsky and his followers simply stopped talking of meaning – replacing the idea with ‘computability’ instead. Linguists now spoke not of intention, belief or agency but of mechanical ‘inputs’ and ‘outputs’ – notions not too different, as Bruner(86) points out, from the ‘stimuli’ and ‘responses’ of the behaviourists who were supposed to have been overthrown. While the overthrow of behavourism was widely celebrated, the ‘revolution’ intended by Chomsky’s corporate sponsors had nothing to do with the establishment of a science of human meaning. As these forces championed Chomsky in steering the ‘cognitive revolution’ along channels narrowly defined by their specific commercial and political goals, the intellectuals who had supported generativism ‘from the left’ felt betrayed. Had they been able to unite, they might have comprised a formidable intellectual and political force. In the event, however, Chomsky’s politics served him and his sponsors well. Left-wing resistance to Chomsky’s science was always tempered by respect for his moral and political integrity. How do you attack an ‘enemy’ who is on your own side? The ambivalence ended up simply paralysing the opposition, whose splits and disagreements left Chomsky with a free hand – which he used quite mercilessly. It is fair to say that most of those linguists and other creative thinkers whose contributions were excluded by Chomsky had political sympathies not vastly different from his own. Together, they could have mounted an impressive intellectual defence of the unity and autonomy of science. In the event, it was Chomsky’s defection that sealed their fate. Alienated from the academic mainstream, this talented individual was in effect selected by corporate America to do an extraordinary double-act, playing the role of chief enforcer for the new corporate science at home – while using this very status to gain a hearing as the most eloquent academic critic of US policies elsewhere across the globe. 1 Harris, R. A. 1993. The Linguistics Wars. New York and Oxford: Oxford University Press. 2 Maclay, H. 1971. Linguistics: Overview. In D. Steinberg and L. Jakobovits (eds), Semantics. Cambridge: Cambridge University Press, p. 163. 3 Chomsky, N. 1957. Syntactic Structures. The Hague: Mouton. Chomsky 1957, p. 1. 4 Chomsky, N. 1965. Aspects of the Theory of Syntax. Cambridge, MA: MIT Press, p. iv. 5 Chomsky, N. 1988. Interview with James Peck (ed. ), The Chomsky Reader. London: Serpent’s Tail, pp. 1-55. The quotation is on pages 15-16. 6 Newmeyer, F. J. 1986. The Politics of Linguistics. Chicago & London: University of Chicago Press, pp. 85-6. 7 Interview with James Peck, p. 17. 8 Syntactic Structures, p. 18. 9 Peters, S. and R. Ritchie, 1969. A note on the universal base hypothesis. Journal of Linguistics 5, pp. 150-52. Peters, S. and R. Ritchie, 1971. On restricting the base component of transformational grammar. Information and Control 18, pp. 493-501. Peters, S. and R. Ritchie, 1973a. On the generative power of transformational grammars. Information Sciences 6, pp. 49-83. Peters, S. and R. Ritchie, 1973b. Nonfiltering and local-filtering transformational grammars. In J. Hintikka et al., (eds), Approaches to Natural Language: Proceedings of 1970 Stanford Workshop on Grammar and Semantics. Dordrecht, Netherlands: Reidel, pp.180-94. 10 Harris, R. A. 1993. The Linguistics Wars, pp. 179-80. 11 Bach, E. 1974. Explanatory inadequacy. In D. Cohen (ed. ), Explaining Linguistic Phenomena. New York: Wiley & Sons, p. 158. 12 Chomsky, N. 1981. Lectures on Govemment and Binding. Dordrecht: Foris. 13 Chomsky, N. 2000. New Horizons in the Study of Language and Mind. Cambridge: Cambridge University Press. 14 Chomsky, N. 1995. The Minimalist Programme. Cambridge, MA: MIT Press. 15 Chomsky, N. 1979. Language and Responsibility (Interviews with Mitsou Ronat). New York: Pantheon. 18 Chomsky, N. 2004. Language and Mind: Current thoughts on ancient problems. In L. Jenkins (ed. ), Variation and Universals in Biolinguistics. Amsterdam: Elsevier, pp. 379-405. The quotation is on page 395. 19 New Horizons, pp. 64-66. 20 Chomsky, N. 2002. On Nature and Language. Cambridge: Cambridge University Press, p. 76. 21 Chomsky, N. 1976. Reflections on Language. London: Fontana, p. 186. 23 Chomsky, N. 1988. Language and Problems of Knowledge. The Managua Lectures. Cambridge, Mass: MIT Press, p. 167. 24 Chomsky, N. 1991. Linguistics and cognitive science: problems and mysteries. In Kasher, A. (ed.) The Chomskyan Turn: Generative Linguistics, Philosophy, Mathematics, and Psychology. Oxford: Blackwell, pp. 26-55. The quotation is on page 50. 25 Language and Mind, p. 394. 26 Chomsky, N. 2000. The Architecture of Language. Oxford: Oxford University Press, p. 4. 27 Chomsky, N. 1996. Powers and Prospects. Reflections on human nature and the social order. London: Pluto Press, pp. 29-30. 28 New Horizons, pp. 106-33. 29 Powers and Prospects, p. 30. 30 Interview with James Peck, p. 13. 31 Interview by David Barsamian. Quoted in Rai, p. 7. 32 Interview with James Peck, p. 5. 33 Interview with James Peck, p. 6. 34 Interview by David Barsamian. Quoted in Rai, Chomsky’s Politics, p. 8. 35 Chomsky, N. 1988. Interview with James Peck, p. 13. 36 Barsky, R. F. 1997. Noam Chomsky: A life of dissent. Cambridge, MA: MIT Press, p. 16. 37 Otero, C. P. 1981. Introduction. In N. Chomsky, Radical Priorities. Montreal: Black Rose Books, p. 38. 38 Chomsky, N. 1981. Radical Priorities. Montreal: Black Rose Books, p. 224. 39 Chomsky, N. 1988. Language and Politics. Edited by C. P. Otero. Montreal: Black Rose Books, p. 144. 40 Language and Politics, p. 773. 41 Chomsky, N. 1988 . Language development, human intelligence, and social organization. In The Chomsky Reader, pp.183-202. The quotation is on page 192. 42 Interview with James Peck, pp. 6-7. 43 Language and Politics, p. 119. 44 Interview with James Peck, p. 8. 45 Jacoby, R. 1987. The Last Intellectuals: American Culture in the Age of Academe. New York: Basic Books, pp. 96-7. Quoted in Barsky, R. F. 1997. Noam Chomsky: A life of dissent. Cambridge, MA: MIT Press, pp. 85-6. 46 Skinner, B.F. 1957. Verbal Behavior. New York: Appleton Century Crofts, p. 3. 47 Radcliffe-Brown, A.R. 1960 . Historical and functional interpretations of culture in relation to the practical application of anthropology to the control of native peoples. In A. R. Radcliffe-Brown, Method in Social Anthropology (Selected Essays). Bombay: Asia Publishing House, pp. 33-35. The quotation is on page 35. 48 Harris, R. A. 1993. The Linguistics Wars, p. 55. 49 Chomsky, N. 1988 . The manufacture of consent. In J. Peck (ed. ), The Chomsky Reader. London: Serpent’s Tail, pp. 121-136. The quotation is on page 131. 50 Bloomfield, L. 1970. A Leonard Bloomfield Anthology. Edited by C. F. Hockett. Bloomington: Indiana Press, p. 227. 51 McDavid, R. I. 1954. Review of Warfel (1952). Studies in Linguistics 12, pp. 30-32. 52 Language and Problems of Knowledge, pp. 137-8. 53 Gleitman, L. R. and Elissa L. Newport, 1995. The invention of language by children: environmental and biological influences on the acquisiton of language. In Daniel N. Osherson (ed. ), An Invitation to Cognitive Science. Gleitman L. R. and Mark Liberman (eds), Volume 1, ‘Language’. Cambridge, MA: MIT Press, pp. 1-24. Goldin-Meadow, S. and C. Mylander 1984. Gestural communication in deaf children: The non-effects of parental input on early language development. Monographs of the Society for Research in Child Development 49 (3-4), serial no. 207. 54 MacNeilage, P. F. 1999. Whatever happened to articulate speech? In M. Corballis and S. E. G. Lea (eds), The Descent of Mind. Psychological Perspectives on Hominid Evolution. Oxford: Oxford University Press, pp. 116-37. 55 Lenneberg, E. H. 1967. Biological Foundations of Language. New York: Wiley. 56 Chomsky, N. 1959. Review of B.F. Skinner’s Verbal Behavior. Language 35(1), pp. 26-58. The quotation is on page 57. 57 Chomsky, N. 1985. Turning the Tide: US Intervention in Central America and the Struggle for Peace. Boston: South End, p. 252. 62 Problems of Knowledge and Freedom, p. 100. 64 Interview with James Peck, p. 6. 65 Chomsky, N. 1988 . The manufacture of consent. In J. Peck (ed. ), The Chomsky Reader. London: Serpent’s Tail, pp. 121-136. The quotation is on page 136. 66 Interview with James Peck, p. 22. 67 Chomsky, N. 1998. The Common Good (interviews with David Barsamian). Chicago: Odonian Press, p. 128. 68 Interview with James Peck, p. 21. 69 Boyd Tonkin (quoting Chomsky), ‘Making a Difference’, City Limits (London), 26 January-2 February 1989, p. 58. Cited in Rai, p. 138. 70 Chomsky, N. 1975. Towards a humanistic conception of education. In Walter Feinberg and Henry Rosemount (eds), Work, Technology, and Education: Dissenting Essays in the Intellectual Foundations of American Education. Chicago and London: University of Illinois Press, p. 219. Quoted in Rai, p. 138. 72 Kuhn, T. 1970. The structure of scientific revolutions. International Encyclopedia of Unified Science, Vol. 2, 2nd edn. Chicago: University of Chicago Press. Latour, B. and S. Woolgar 1979. Laboratory Life. The social construction of scientific facts. London: Sage. 73 Haraway, D. 1989. Primate Visions. Gender, race and nature in the world of modern science. New York and London: Routledge. Nader, L. 1996 (ed. ), Naked Science. Anthropological Inquiry into Boundaries, Power, and Knowledge. London & New York: Routledge. 74 Interview with James Peck, p. 16. 75 Powers and Prospects, p. p. 31. 76 Language and Problems of Knowledge, p. 36. 77 De Saussure, F. 1974 . Course in General Linguistics. Trans. W. Baskin. London: Fontana/ Collins, p. 14. 78 Language and Problems of Knowledge, pp. 36-7. 79 As above, p. 173. 81 Language and Problems of Knowledge, p. 174. 82 Bruner, J. 1990. Acts of Meaning. Cambridge, MA: Harvard University Press, pp. 2-3. 85 Fodor, J. 2000. The Mind Doesn’t Work That Way. The Scope and Limits of Computational Psychology. Cambridge, MA: MIT Press, p. 13. 86 Bruner, J. 1990. Acts of Meaning. Cambridge, MA: Harvard University Press, p. 7. 87 Leech, G. 1983. Principles of Pragmatics. Longman Linguistics Library, p. 3. 88 Bates, E. 1984. Bioprograms and the innateness hypothesis. Behavioral and Brain Sciences 7: 180-190. Whilst the quality of the writing in this article is admirable, the main thrust of the argument, and its assembling of 'evidence' is rather ridiculous. This section in particular stood out to me in terms of sheer fantasy of Chomsky as the tool of a wider intervention of the 'corporate world' into the development of linguistics. In the event, Chomsky forged an anti-behaviourist coalition linking much of the academic left with those corporate forces – including the military – who were underwriting the development of the nascent computer industry. It was an unholy alliance, and as such was destined to fall apart once the behaviourist enemy had been overthrown. It is understandable if one wants to separately critique Chomsky's political stance or elements of his academic career, and i even find an attempt to link the two into a single critique of the man's work to be a clever critical approach. But what pierces through this whole article is the mechanical feel of someone writing whilst doggedly sticking to the original concept of the piece, no matter how ridiculous a critique it starts to become. It particularly feels as though this pre-meditated attempt to 'kill two birds with one stone' continues on and on until it starts to find the link between those two stones far more tenuous in reality than was assumed before the piece was written, progressively decaying into the projection of a rather unverifiable and conspiratorial view upon the genesis of Chomsky's academic studies. Similarly its conceptualisation of the field as being dominated by the 'natural ascendancy of the left' is of no interest. Whilst i would like the academic world to be dominated by libertarian communists, i would also like it to be dominated because it is their theories that stand up the most to scientific and theoretical scrutiny. If we look at Marx, we can see that part of the reason his theories were so powerful (and in my opinion 'correct') is due to his willingness to engage with thinkers from foreign schools of thought and rather different political backgrounds, and accept whole parts of their theories as correct. Therefore we should not view Chomsky with disdain simply because 'Corporate America' found value in his theories. Science 'belongs' to neither left nor right, it just so happens that currently within the context of capitalism we must accept that sometimes business interests find use in certain theories in order to develop their own accumulation of capital. This should not, and does not, implicate the developers of those theories as somehow 'guilty' of 'betraying' the interests of 'the left' (whoever they are) in the academic world. Responding to Harrison's points: No. If you read the article carefully, you'll notice that it's saying the opposite. It's pointing out that 'Corporate America' did NOT find the slightest value in any of Chomsky's scientific theories. The article is arguing that Chomsky, in the final analysis, gave the US military nothing. To put it bluntly, he sold them a pup. Yes, the folk at the Pentagon initially hoped that his project to design a language ‘device’ might enable them to enhance their command-and-control systems. That was what Chomsky was officially supposed to be doing for them in that Research Laboratory of Electronics back in the late 1950s. That was why they were investing so much money in the 'machine translation' project to which Chomsky was initially assigned. But in reality, whether by accident or design, nothing he ever came up with had the remotest practical application, doubtless to Chomsky the libertarian communist's relief. You have to remember Chomsky's candid admission that he is in many ways two separate people, neither of whom is on speaking terms with the other. Chomsky the scientist’s strangely intangible, miraculously installed, universal and immortal 'language faculty' was (as he himself readily concedes) a 20th-century revival of Plato's ancient doctrine of the soul. Not even the US military could find much use in their gadgetry for that kind of thing. Even to this day, no electronic gadget has in real life been equipped with a soul. The idea is complete nonsense - nonsense from start to finish. If the US military had been able to make technical or other intellectual use of Chomsky's 'language device' theories for military purposes, that would have been interesting and significant. We might even have discerned some real parallel with, say, Einstein's genuinely scientific breakthrough linking mass, energy and the speed of light. Any such practical outcome, however unpleasant the military consequences, might have forced us to acknowledge the scientific merit of Chomsky's ideas. What the article is saying is that this never happened. From the standpoint of the Pentagon boffins, nothing worked. No matter how many times Chomsky ditched his latest celebrated theory in favour of some radically new attempt, they never got their 'device'. The explanation is not difficult to grasp. The whole idea of tracking down ‘Universal Grammar’ in order to confer linguistic creativity on a machine was catastrophically misguided from the start. Fortunately for all of us, there never will be and never can be such a machine. The article is clarifying that, in the end, 'Corporate America' could only make political use of the platonic, idealist, ultra-individualist, quasi-creationist, pseudo-scientific gobbledegook which Chomsky the principled anarchist poured out over the years in his alternative capacity as the world's most prominent linguist. Poor Hedgehog. Apparently didn't get enough oxygen.